The latest LEGO Star Wars direct-to-consumer set has been revealed at Star Wars Celebration! You can find additional images on the set details page. It is interesting that neither the Ultimate Collector Series nor the Master Builder Series are mentioned anywhere in the press release or on the packaging. This model appears to fall somewhere between the two ranges as it looks very detailed while also incorporating some play functions. Are you impressed with 75244 Tantive IV and why do you think it has no Ultimate Collector Series or Master Builder Series branding? Let us know in the comments. Bail Organa? Has that been a minifig yet? Either way, sounds fantastic, if not a bit... Expensive. I'm going to buy it. Now, with that out of the way....it looks kinda smallish. At least to me. Maybe I was holding out hope for another massive UCS set. Perhaps the UCS label turns off some parents who fear the set is too advanced for their child? 12+ suggestion is lower than most UCS end up with. Pretty sure the ditched the UCS/MBS label so that no one would complain about it being one or the other. Although this set manages to cover both quite well. Too similair to the 2009 one. 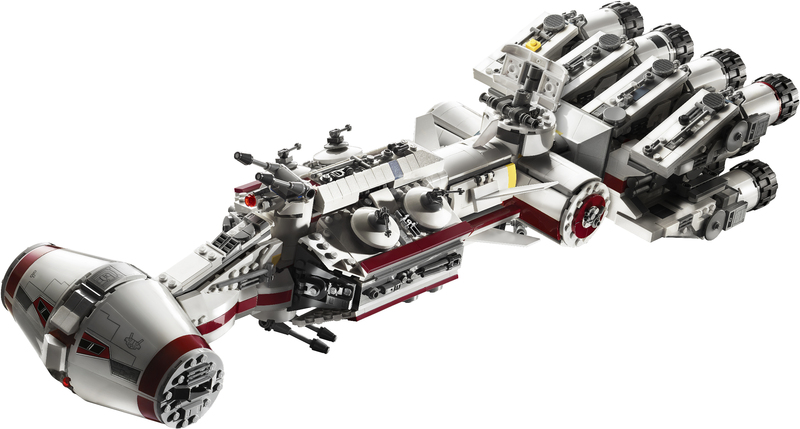 The UCS version of the Tantive IV deserves a remake more. Half price, or 30% off maybe. It's nice but it's not grabbing me. Help me, 75244, you're my only hope. Another set I don’t really need - I have the 2009 version and am perfectly happy with it - but they include a never before released minifigure...just like the new Slave 1 and Zuckuss. Stickers!...pass! Doesn’t look ‘UCS’ enough but the price definitely is ‘UCS’. AU$330!! I honestly think 10198 looks better. Less ‘busy’ looking. Serious Question would you rather get this set hat has 1768 Parts for £179.99 for this set or the Ninjago Destiney's Bounty with 2295 parts for £109.99. I love the build and figures but this should have been £150 at most this set is not worth the value, and I know its a licensed set and has a few large parts but it feels like a rip off to me. But I really want this set as the figures look so good and the build is epic. Set is great, but price and value weigh this set down so much. If I'm being completely honest, I don't particularly like it. All the proportions just seem off to me. In particular, the area between the front hammerhead section and the middle section feels way too long and thin. This isn’t a ucs set, this is a play set. Stud shooters, flick fire missiles, and a handle to pick it up. Not saying it’s another insult on Hoth or anything, it looks fine, but it worries me that these sets keep getting smaller and smaller, and more and more expensive, with not even a good price to piece ratio to back it up. $270 dollars for 1700 pieces is not a good value in my opinion. 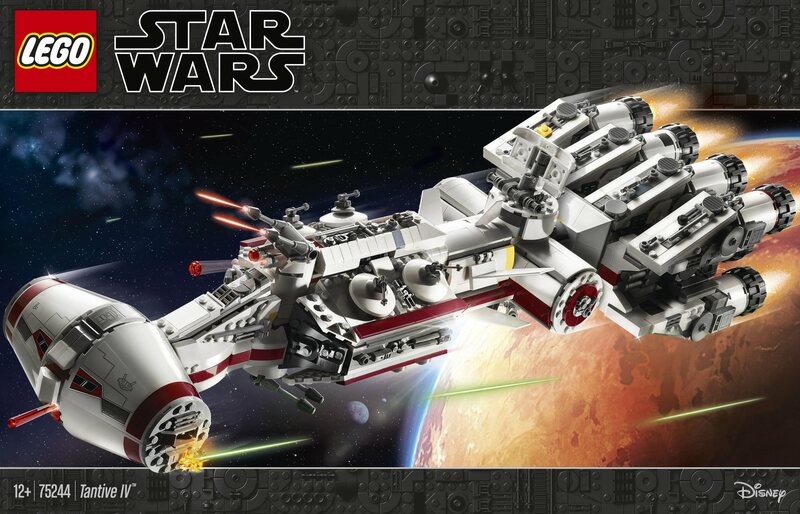 Lego's been doing an awesome job borrowing the best from the UCS line and incorporating it into the standard line. The latest X and Y-Wings are excellent and I love seeing this trend continue. This model looks fantastic, and even the price isn't bad given the usual Star Wars tax. Keep up the good work! It's not branded UCS or MBS because... it isn't either of those. It's a large, minifig-scale ship. I like that they include regular legs for Leia in addition to the skirt piece. The minifigure photos show Leia in a skirt, but one of the 'action' photos shows her with normal legs. I wonder if it includes both? It'll be a day-1 for me, but if I already had 10198, I'm not so sure. Like others have said, something about it feels kinda off. Wonder if it's the photography? Some sets just don't seem to look as good in photos as they end up being in person. ^ The main image shows a spare pair of white legs. I have a gut feeling this is meant to be in a similar niche as the Darth Vader's Castle. Its a more limited distributed set, but still a playset focused build that can also double as a display piece. The length and thinner look seems to be screen accurate from what I can tell, helping to remind me of similar spaceships of 60's/70's Sci-Fi (2001 Space Odyssey and the probe crafts in Space Mountain at Florida and California come to mind). Two feet (62cm) is also a decent length for the model and means it will probably look great on a shelf. Stickers on the front are a bit of a cop-out considering the last one ten years ago used prints in the front, but its not a deal breaker for me. The problem is the price... I look at this and think of a $150 USD set, not a $200 one. A few more minifigures, either Rebel Troopers or Stormtroopers and Vader would have helped justify that price. Regardless, Bail is excellent. The much longer Saturn V model for example is a foot longer than the Tantive IV, has nearly 200 more pieces and $100 less in price (although mind you the Saturn V is lacking in interior detailing). Lucasfilm has always been a high cost licensee partner for Lego, but this is definitely a case were the Lucas/Disney tax really shows. I want this model, but until it goes on sale I really doubt I can justify it. ...Lego hasn’t quite “jumped the shark” yet with SW but how many more unoriginal re-hashes are we gonna get? A new minifig? Thats it? Well, whatever helps bring on the end of this crack habit and the onset of something new-ish... Space! If I didn't own one already I'd be tempted. On the other hand, it's a lot of money and I'd probably have to think long and hard about buying a set that likely will not go on sale. What are the chances that all of these minifigures appear in other sets? The comments about the proportions of this model are interesting. #10198-1 Tantive IV is a superb set but the proportions of its fuselage are probably closer to the Tantive III, formerly known as the Sundered Heart, than the Tantive IV. This rendition, on the other hand, seems suitably narrow and sleek when compared with the movies. @OscarWRG - The yellow brick is intended for storing additional missiles for the spring-loaded shooters. You can see the storage compartment in one of the additional images. You’re backorder! You can play Rebel base! Really want this one but will hold off a few months. Like I did for Harry Potter. Black to the engines looks odd. Just glad it’s not grey. What colour blasters are the minifigs holding? Now have to decide between this and Slave 1. It CANNOT be both.....thanks a bunch for yet another consumerism dihlemma TLG! I must admit seeing this and how the packaging is similar to UCS sets worries me. Do you think Lego has dropped the UCS name? A UCS set usually get realised around MAy and October time. Is this years set minus the UCS label and plaque and this is the norm going forward. When I heard the rumors of the May 4th set being a new UCS Tantive IV, I was really excited. This... is not exciting to me. I wanted to see a new replacement of the 10019, not the 10198. For the 20th Anniversary of the LEGO Star Wars line and for the May 4th set, I was hoping for so much more than this. I'm glad we're getting a Bail Organa minifig, but other than that, this is going to be a disappointing purchase for me (but I'll buy it anyway). They should include both legs and a dress piece more often. McGonagall is just one of the characters I can think of benefitting from that. Definitely getting that dress piece for Leia, not interested in Tantive IV but it's a very well designed model! I skipped the last one but I did get the original even though officially in my dark ages. I've always been a Star Wars fan and seeing it reduced to £50 (I think from £150) in the long-closed Kingston Lego store was too good to miss. That thing was massive. It's currently in my parents' loft so I don't have it included in my "official" post dark ages Brickset list. I might have to retrieve it but I don't think time has been good to its stickers and elastic bands. This did look too long to me as well, but looking at pics of the actual ship, it does seem to be better proportioned. Real bummer about the stickers on the front, but skirt Leia and Antillies are too good to pass up. I saw a pic of Leia where someone had put a white hood on her and she looks amazing. Wish they'd included that rather than the white legs. At least there's a 2019 Spider-Man set where you can get the hood, but it's on a pretty desirable figure anyway. Spider Gwen is it? Not for me, UCS price but without the size and detail and no display stand. Should be priced at around £125 to £150 to make it more attractive. I’ve been looking forward to this set for a while, but I’m honestly a little dissiapointed. I was hoping for a more accurate UCS model. I think the best option would have been to make it microfigure scale like the Rexcelsior or Saturn V with an emphasis on accurate exterior details, and then add the most important minifigures on a separate display stand. On that note, Bail Organa is awesome! Also, stud shooters on a would-be UCS set! That’s sacrilege. I have been looking forward to a Tantive IV set since coming out of my dark ages and now that it's here I'm not really interested. I was really hoping for a UCS set, not a play set. I don't want stud shooters and spring loaded shooters or a full crew of minifigs! Well, this is going to be a very expensive year! There is no doubt that the sets are designed better with more details than previous ones...but come on Lego the price is too much for what it is really.... 229.CAD was/is my hard limit. I will definitely be getting this but the lack of a stand and UCS plaque is a bit annoying. I'm in a similar yet wildly different position as @Lochdent -- I've been waiting years and years for another shot at the Tantive IV, and now it's here and I have to pass right off... except I was the one hoping for a nice minifigure-scale version... which to be fair, this is, but, well, It's trying to be a toy and a UCS set, but the compromises in each direction cause it to fail at the other. It's too expensive as a toy and too subpar for UCS. Stunning and a must buy. Really don't want the childish flick-lasers and playset features either. Missed out on 10019 and 10198, so I’ll pick this up. Have to say, it looks excellent. The detail on the hull is superb. Only pity is that it’s not a formal UCS with a plaque and stand, and it’s size won’t match up to 10019. But, it’s more accurate than 10019, and more detailed. I love it. It's exactly what I need! I don't need another UCS Tantive IV, but I DID miss the 2009 model and have regretted it terribly. Never got the original one but if I don't earn it on a contest I will buy Vader Castle instead. Its not called a UCS or MBS because its not supposed to be. MBS are (as far as we know) large playsets, while UCS are heavily detailed collector items. This is just a regular set with a high price point. And I think that's intentional. Looks alright though. I'm disappointed there aren't any stormtroopers or Vader. Is it just me, or does the ship look too thin and long? I'm never buying it, I think it looks nice but super thin. At least the price isn't too bad. Sorry, to those who already have the old one, but this is the most exciting large set for me since the ewok village. I missed out on the first tantive iv. I have the 2009 version and this one is so close I’m happy to pass. I hope for a great UCS set in the fall. Ooh, this I like! For a €200 (German price) set it would have been nice if it included an extra rebel soldier, and some other astromech droid with a cone head, as well as a display stand. The previous renditions both somehow seem bulkier, more massive, even though this new one has a higher piece count than the first UCS set of this spaceship. Want, but it's another rip-off for us with the usual case of price-gouging for NZ. Somehow that little hop across the Tasman Sea adds 15% to the price compared with Oz. Notable that the Australian price matches the UK price. Also notable that the NZ price is a whole 33% more than US. Market bias much, LEGO? Personally I am somewhat glad that this is the set that came out.... as indeed it will be a fairly easy pass for me. That said, IMHO it looks quite good. 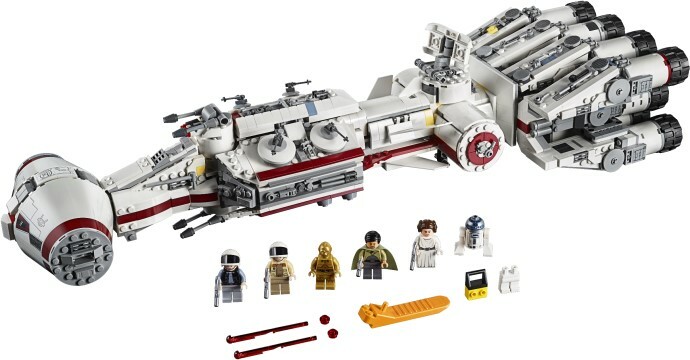 @theguru1974, it’s almost as if this meant to be a set for those that don’t have the other one, considering it came out sometime ago and there are new Lego fans everyday that decide to hop on the Star Wars train. It’s also meant to appeal to people that like the play features. It’s not a UCS set, it’s a regular set. This looks fantastic and have put it on my 'Wanted' list but I'll have to wait for it go on sale somewhere before adding it to my collection. Those enormous red stickers are unforgivable. Like the yellow stickers for the Y-Wing but worse. Hopefully the UCS Imperial Star Destroyer won't disappoint. First feeling is that of initial excitement turning to slight disappointment. I like the challenges and intricacies of the UCS models. No doubt this model looks great but will it be a worthwhile build? I’ll wait for Capn Rex and others on that. In the email announcement to LEGO VIP members, it reads "Ultimate LEGO Star Wars™ sets to collect, build and display! ", showcasing the Millenium Falcon and the Cloud City along with Tantive IV. I guess there is even a confusion within LEGO itself about the branding. Although 10019 looks impressive, the proportions are way off. The body is too short, the engines are way too short, and the hammerhead is WAY too big. If the 10019 head was to give the size of a correctly proportioned model it would be huge - 5000 pieces and more than a meter long. Although not impressive, the new model has much better proportions. Considering the high price, it wouldn't have hurt to make a better cockpit in my opinion. The ship from 2009 has transparent pieces in the front - now only a big sticker, as far as I can see. Not bad....I've owned the UCS and 10th Anniversary edition but disliked the inaccuracies with those ships. They made some incremental improvements, but really wish they went the extra mile made this into an accurate UCS version. Too bad about the huge sticker sheet (10019 had none!). It’s clearly not UCS. It’s not like the other Master Builder Series. So I don’t understand that debate. I’m more surprised it’s not labelled 20th anniversary, with a special figure to match. Tantive IV makes much more sense as a milestone set than all the 20th anniversary ones, to me. Will probably get it once the ppp drops below 10, but where will I put it? It looks beautiful. One of those sets I always had my eye on. Instant buy for me when this comes out. Vader (force choking Antilles): Where are the Death Star plans? Antilles: We do not have them! Vader: It's a $200 set and you would have me believe they forgot to include them? Antilles: Well they did, and by the way, you are not in this set either! Looks pretty nice, but not $200 nice. My biggest issue with it is that massive stickered cockpit. I also don't like the use of spring yellow to make it look weathered, but that would be an easy fix. This isn’t a UCS set. It’s a remake of the 2009 10th Anniversary set. Which somehow seems worse. It’s a great set. But remaking the prior anniversary set for the next big anniversary? It feels tacky. It’s like Star Wars can’t do anything new.... looks at ep IX trailer...oh right! They aren’t even allowed to change clothes anymore. Generally I like it, but stickers for the cockpit?!? Ugh. Looks like a pretty sweet ship to fly around the house and shoot "PEW PEW PEW" sounds at my three year old. I'm serious. You have any idea how fun that is? Somebody add a "Rogue One" tag to this thing, post-haste! Iconic and therefore too expensive... Especially in France. Can't get used to that. I always wanted to original as a kid, but that itch has faded quite a bit recently. Regardless, seems like a nice enough set. Shame it doesn't come with Rebel Friend! Only disappointment is that this wasn't an Episode III Corvette, since Bail Organa was included. Great figure though, very pleased. Just added 10198 to my collection and looking forward to getting this one as well. But yeah, where's the rebel friend? I've been hoping for one of these for a long time, looks great! Pretty disappointed, I have been waiting for an UCS version of this set to revamp the 10019 one, instead TLG produced another 10198 to "play" with. I guess the wait is going to continue. So... UCS box design but no UCS labeling? I’m very lost here. It does look too small for the price. As usual they are made with lots of decorative pieces nowadays (design wise is not too bad, nevertheless). But with the money which is probably 40% above what I wish to pay, I could get into other hobbies and enjoy it more.